Distributed antenna systems (DAS) play a key role in future wireless communications. Despite the increasing previous research work, the channel models of DAS lack generality. This paper presents a holistic and generic channel model, which incorporates path loss, lognormal shadowing, and generalized-gamma fast fading into consideration. This overarching composite channel model encompasses well-known composite channel models as special cases. A probabilistic system outage model is attained by selective transmission scheme in terms of the proposed channel model and the distribution of mobile stations in the cell. Experimental results substantiate that the theoretical model provides sufficient precision for evaluating the outage performance of DAS. Due to the limited wireless resources, the transmission distance cannot be too large if the transmission rate is very large. To have a reasonable coverage area, antennas that are centrally attached to the base station in co-located antenna systems should be distributed throughout the cell so that the access distance for mobile stations (MSs) can be shortened. Such a system is called a distributed antenna system (DAS). Extensive studies have shown that DAS can enhance coverage, improve capacity, reduce outage, etc.[1–3]. Without any doubt, DAS will become a very promising candidate in future wireless communications. Recently, the channel modeling and performance analysis of DAS have drawn significant attention. Assuming that the path loss is a constant, both the uplink and downlink capacities of DAS were investigated in. This assumption is not always reasonable because the distances from the MS to each distributed antenna are usually different. Therefore, the path loss cannot be ignored. Zhu analyzed the spectrum efficiency of DAS, but the shadowing was ignored. Due to the large space among distributed antennas, it is not reasonable to assume that all antennas experience the same shadowing. Nikolopoulos et al. investigated the narrowband fading in indoor DASs, which only considered the fast fading. However, experimental measurements have shown that fast fading and shadowing occur simultaneously in practical systems. Therefore, composite channel models should be considered for performance analysis. Furthermore, investigated the channel model which combines the fast fading and lognormal shadowing effects. Then,[9–11] considered channel models which take path loss, lognormal shadowing, and Rayleigh fading into account. Chen et al. and de Lima et al. analyzed the system performance of DAS over composite shadowed-Nakagami-m fading channels. Although[9–13] considered composite channels, the fast fading was modeled by Rayleigh and Nakagami-m, which are special cases of the generalized-gamma distribution, and thus, the derived results lack generality. In addition to the channel model, the distribution of MS is another important factor that should be considered. As is well known, the distribution of MS has strong impact on system performance. However, some previous works assumed that the position of MS is pre-given, so they did not consider the impact of the position of MS on system performance[10, 12]. The other previous studies assumed that the MS is uniformly distributed in the cell[15–17]. However, for some scenarios, such as dense urban scenario, office building scenario, et al., the distribution of the MS may form a hot zone, and thus, the uniform distribution of MS may not always be a practical situation. Therefore, it is of interest and necessary to study the impact of the distribution of MS on system performance. Motivated by the aforementioned literatures, we present a new composite channel model for DAS in this paper, which is represented as a mixture of path loss, lognormal shadowing, and generalized-gamma fast fading. The channel model in this paper is a generic model that covers many well-known composite channel models, such as Nakagami-lognormal, Rayleigh-lognormal, and Weibull-lognormal. 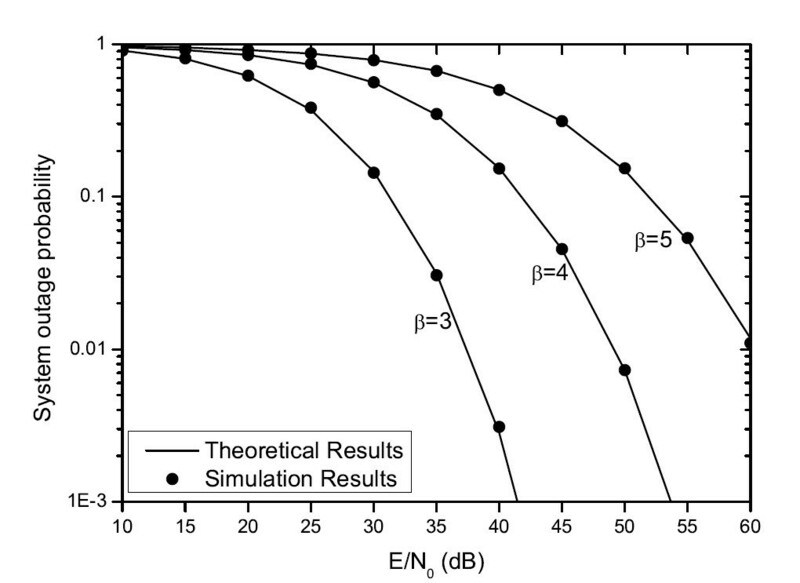 Based on this channel model, the probability density function (PDF) of the output signal-to-noise ratio (SNR) is derived. After that, we analyze the outage probability for the MS over a given position by selective transmission (ST) scheme. Furthermore, considering the distribution of MS in the system, an approximate theoretical expression of system outage probability is derived. The remainder of this paper is organized as follows. System model is described in Section 2. In Section 3, an approximate expression of system outage probability is derived. Numerical results are presented in Section 4 before conclusions are drawn in Section 5. 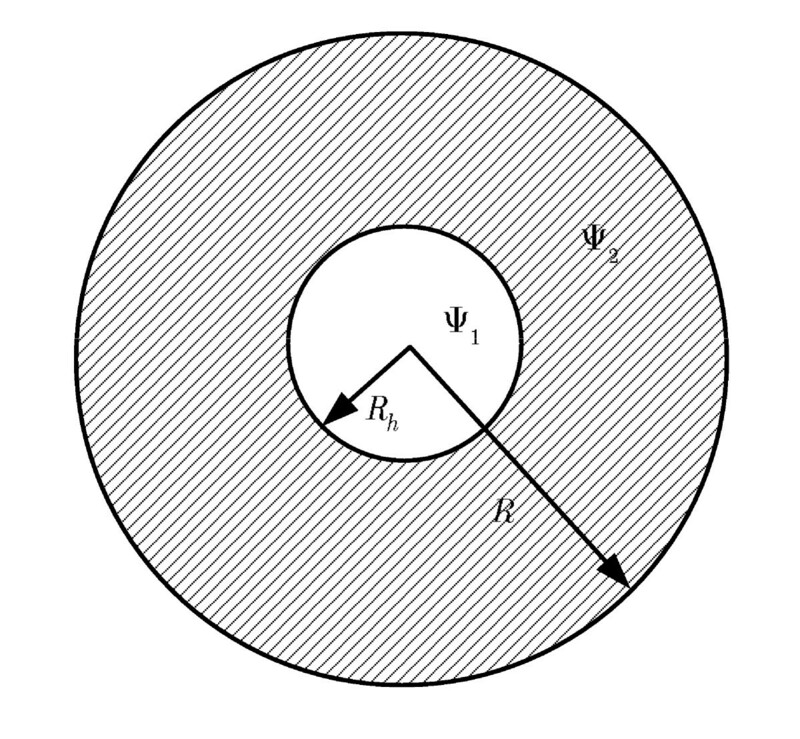 Consider a DAS with a single cell whose covering area is a circle with radius R, as shown in Figure1. 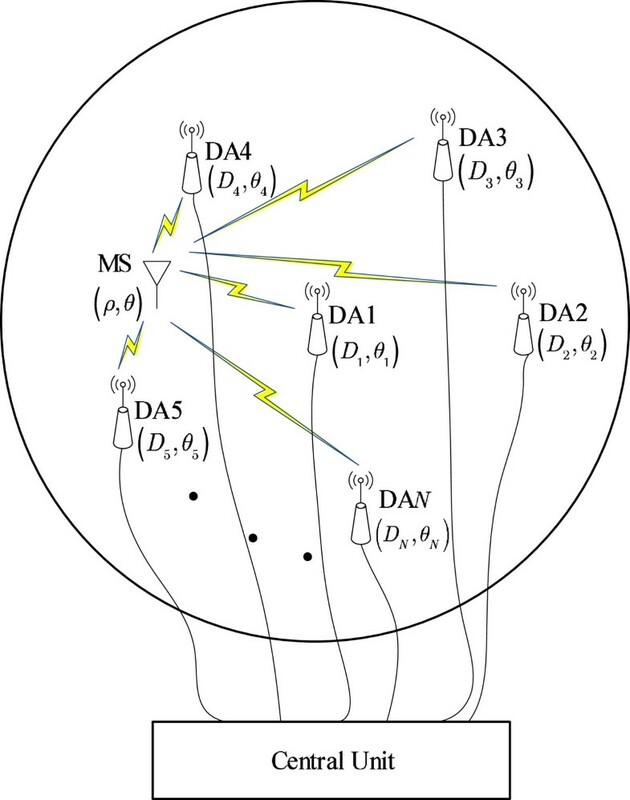 The distributed antennas are arbitrarily distributed in the coverage of the cell, denoted as DAi (i=1,2,⋯,N), and are connected to a central unit via fiber optics. Only one antenna is employed at the MS. The positions of the MS and the DAi are denoted by the polar coordinates (ρ,θ) and (D i ,θ i ), respectively. When the reference point is chosen to be the cell center, ρ, D i and θ, θ i are the distances and angles of the MS and the DAi to the cell center. Structure of a distributed antenna system. where the i th element of Y, y i , denotes the received signal at the DAi, E is the transmit signal power of the MS, h i represents the channel fading between the MS and the DAi, x is the transmit symbol of the MS with unit energy, Z is the complex white Gaussian noise vector with zero mean and variance N0. where d0 is the reference distance, β i is the path loss exponent, d i (ρ,θ) denotes the distance between DAi and the MS, which can be expressed as d i ρ , θ = ρ 2 + D i 2 − 2 ρ D i cos θ − θ i .
where ξ=10/ ln10, μ i (in dB) and σ i (in dB) are the mean and standard deviation of 10log10ω. Based on the definition for γ i , its PDF could be computed. The following lemma gives the analytic form of f γ i .
where μ ~ i ρ , θ = μ i + 10 log 10 E L i ρ , θ / N 0 . The proof of Lemma 1 can be found in the ‘Appendix’ section. γ = max γ 1 , γ 2 , ⋯ , γ N .
where γth is the threshold of SNR. Basically, the formula above states that the value of δ(ρ,θ) is determined by the probability of each Pr(γ i <γth) and the latter one could be estimated as in the following theorem. where t n and H n are the base points and weight factors of the N p -order Hermite polynomial, respectively. The proof of Theorem 1 can be found in the ‘Appendix’ section. δ ρ , θ ≅ ∏ i = 1 N 1 − ∑ n = 1 N p H n Γ m i , m i γ th 10 2 σ i t n + μ ~ i ρ , θ 10 v i π Γ m i .
P out = E ρ , θ δ ρ , θ = ∫ 0 2 π ∫ 0 R δ ρ , θ r ρ , θ ρ d ρ d θ.
where the two even number P and Q are chosen to determine the step sizes h=R/P and k=2π/Q, respectively. In addition, ρ p =p h,(p=0,1,2,⋯,P) and θ q =q k,(q=0,1,2,⋯,Q). The weigh factor cp,q is the element of matrix C, in the (p+1)th row and (q+1)th column. The matrix C can be found in. In this section, we will verify the accuracy of the approximate expression of system outage probability by Monte Carlo simulations. Without the loss of generality, a single-cell DAS with a radius of R is used as the test system. In the system, one antenna is located in the center of the cell, and other antennas are evenly and symmetrically placed on a circle with a radius of 2R/3. For the sake of simplicity, some parameters are assumed to be the same, i.e., β=β i ,σ=σ i , m=m i , μ=μ i , v=v i for i=1,2,⋯,N. The distribution of MSs in the cell. where S h = π R h 2 is the area of region 1 while S=π R2 is the area of the whole cell. λ∈[0,1] is the probability that the MS distributed in region 1. It can be observed that, when λ=Sh/S, the MS in the cell follows uniform distribution; when λ>Sh/S, region 1 is the hot zone, the probability of the MS which located in region 1 increases; when λ<Sh/S, the probability of the MS which located in region 2 increases. 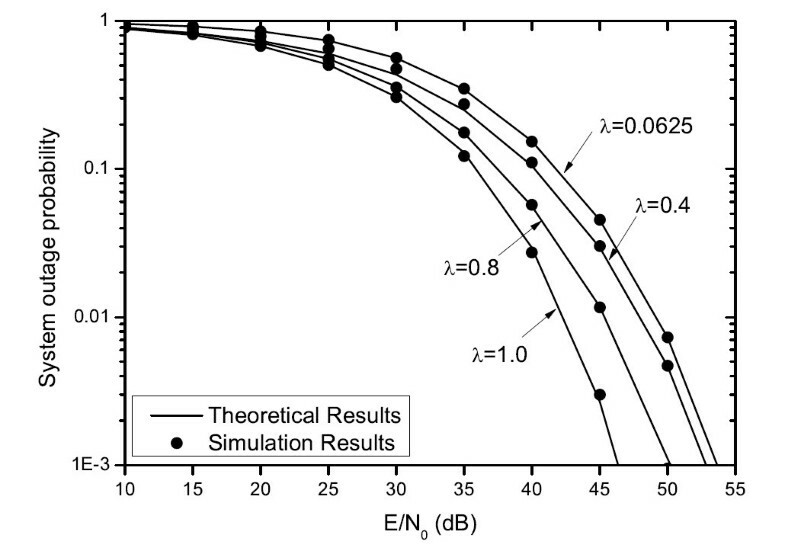 In addition, the main simulation parameters are listed in Table2. 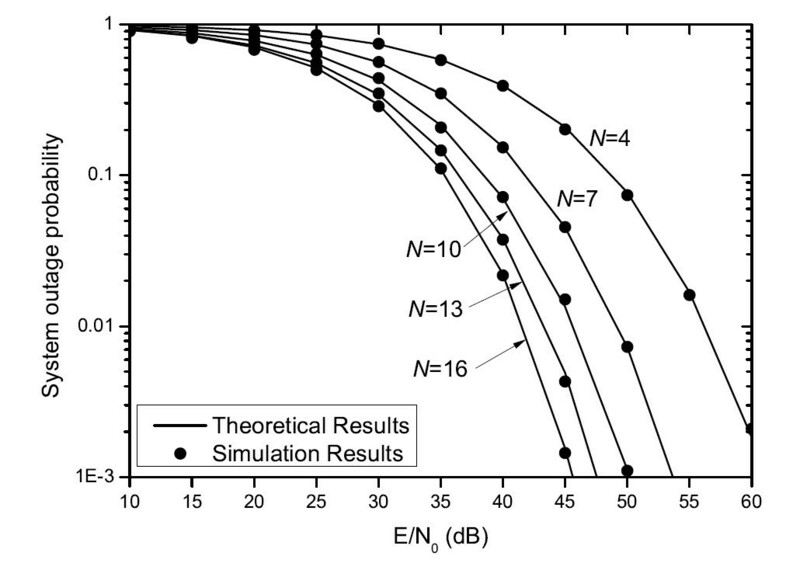 Figures3,4,5,6 and7 show the system outage probability versus the transmit SNR (E/N0) in different scenarios. Obviously, with the increase of the transmit SNR, the received SNR will increase, and thus, the system outage probability will decrease. Specifically, Figure3 shows the system outage probability versus transmit SNR (E/N0) with different numbers of distributed antennas (N). Obviously, the system outage probability drops with the increase of N. When the value of N is larger, a higher diversity gain can be achieved, which will result in a higher output SNR. Therefore, a lower outage probability can be achieved. Furthermore, the gaps between every two neighboring N become narrow with the increase of N. The improvement of outage performance becomes very slight when N increases to a certain extent. Therefore, too many distributed antennas in one cell are not necessary. System outage probability versus transmit SNR with different N .
System outage probability versus transmit SNR with different R (in m ). System outage probability versus transmit SNR with different v .
System outage probability versus transmit SNR with different β . System outage probability versus transmit SNR with different λ .
Figure4 depicts the system outage probability as a function of the radius of the cell (R). This figure indicates that the system outage performance can be improved with the decrease of R. Just as is expected, the smaller the coverage of the cell is, the better the system outage performance becomes. Moreover, the performance gaps between every two neighboring R enlarge with the decrease of R. Generally, we hope the coverage of the cell can be as large as possible, but a large coverage of the cell will reduce the outage performance. Therefore, a tradeoff between coverage and outage performance should be considered in practical communication systems. Figure5 plots the system outage probability with different shape parameters (v). In Figure5, it is depicted that the system outage performance improves with the increase of the shape parameter v. Moreover, the gaps between every two neighboring v become narrow with the increase of v. The improvement of outage performance becomes very slight when the shape parameter increases to a certain extent. Therefore, too large shape parameters are not necessary. Figure6 illustrates the relationship between the system outage probability and path loss exponent (β). It can be seen that the system outage performance can be improved by decreasing the value of β. From Equation (4), it can be seen that the path loss increase with the decrease of β, and then, the channel gain will increase correspondingly. Therefore, the output SNR will become better. That is, the number of communication links which cannot satisfy the SNR threshold will be decreased. In other words, the outage performance is enhanced. Figure7 shows the impact of the distribution of the MS in the cell on system outage performance. Note that, when λ=Sh/S=0.0625, the MS are uniformly distributed in the cell. When λ>0.0625, the probability of the MS which located in region 1 is higher than in region 2. From Figure7, it can be observed that, with the increase of the value λ from 0.0625 to 1.0, the probability of the MS which distributed in region 1 will increase. Since one distributed antenna is located in the center of the cell, the average access distance will reduce, and this will result in the decrease of system outage probability. It should be noted that the system outage probability varies with the value of λ, which indicates that the distribution of the MS has a strong impact on the system outage performance. As is well known, the deployment of distributed antennas has strong impacts on system performance. 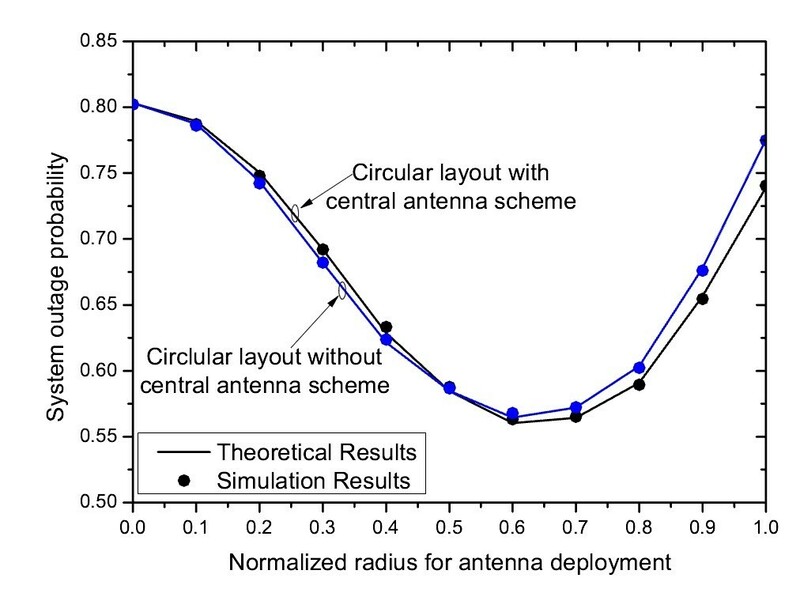 In this simulation, two schemes, i.e., circular layout with central antenna scheme and circular layout without central antenna scheme, are proposed to show the optimal radius for antenna deployment. For circular layout with central antenna scheme, one antenna is deployed in the cell center and the other antennas are evenly deployed on a circle, while all antennas are evenly deployed on a circle for another scheme. Figure8 shows system outage probability versus normalized radius for antenna deployment when MS is uniformly distributed. It can be seen that, when the normalized radius is less than 0.5, the outage probability of the circular layout without central antenna scheme is smaller than that of the circular layout with central antenna scheme. However, when the normalized radius exceeds 0.5, the circular layout with central antenna scheme outperforms the circular layout without central antenna scheme. From Figure8, it can be observed that when the value of the normalized radius is about 2/3, the minimum system outage probability can be derived for both the two schemes. In other words, the optimal radius for antenna placement is about 2R/3 in this simulation scenario. 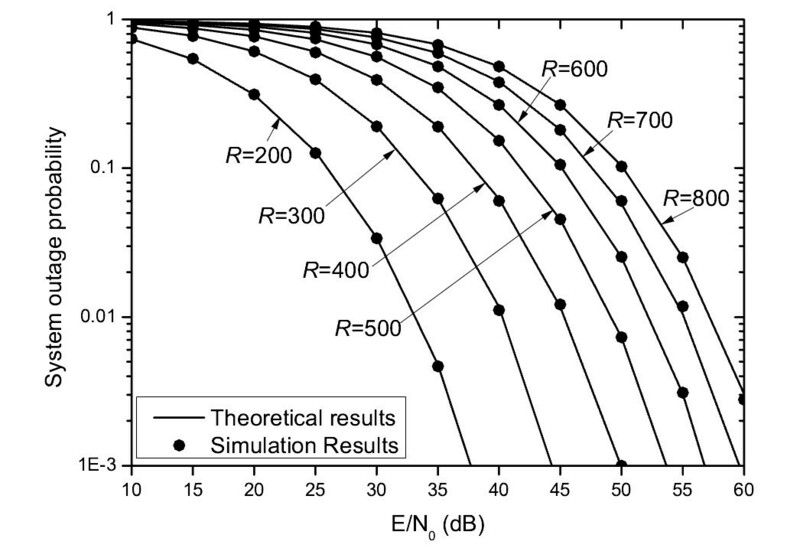 System outage probability versus normalized radius for antenna deployment when E/N 0 = 30 dB, λ = 0.0625, and N = 7. It should be noted from Figures3,4,5,6,7 and8 that the theoretical results and simulation results of the system outage probability are quite accordant with each other. Therefore, the approximate expression of the system outage probability shown in this paper can provide perfect approximation to the realistic outage performance of DAS without time-intensive simulations. Furthermore, this approximate expression can be used to evaluate the system outage probability in different scenarios, and it will lay a very good foundation for further research such as antenna placement and network planning. In this paper, we presented a new channel model for DAS, called shadowed generalized-gamma composite channel. The channel fading in this model is a generic case of many classic models, such as Rayleigh-lognormal fading, Nakagami-lognormal fading, Weibull-lognormal, et al. Under such a channel model, we investigated the probabilistic characterization of uplink system outage with the ST scheme and the distribution of MS in the cell. Using the principle of numerical analysis, we derived an approximate theoretical expression of system outage probability. 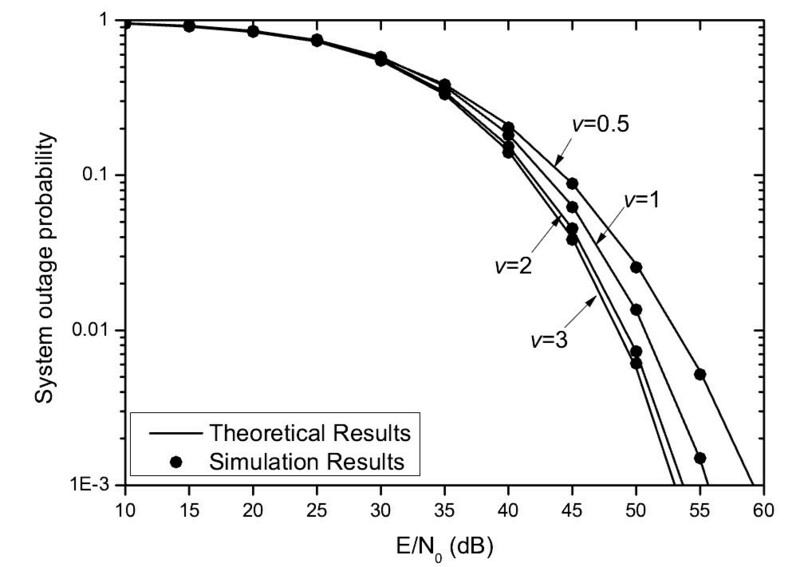 It has been validated by the numerical results, thus showing that the derived approximate expression can be applied to evaluate the outage probability of DAS precisely. F G i 2 g = Pr G i 2 ≤ g = ∫ − g g f G i t d t.
f G i 2 ( g ) = d ∫ − g g f G i t d t d g = v i m i m i g m i v i − 1 Γ m i exp − m i g v i , g ≥ 0 . F γ i S i γ ≤ r s = F G i 2 G ≤ r s = ∫ 0 r s f G i 2 g d g .
f γ i S i r s = 1 s f G i 2 r s = v i m i m i r m i v i − 1 s m i v i Γ m i exp − m i r s v i .
f γ i r = ∫ 0 ∞ f γ i S i r s f S i s d s = ∫ 0 ∞ v i m i m i r m i v i − 1 s m i v i Γ m i exp − m i r s v i · ξ 2 π σ i s exp − 10 log 10 s − μ ~ i ρ , θ 2 2 σ i 2 d s.
Before getting into the details of derivation, we mention two important propositions that are already known. which can be found in Section 2.33 in. which can be found in Equations (25, 4, 46) in. Pr γ i < γ th = 1 − ∫ γ th ∞ f γ i r d r = 1 − ∫ 0 ∞ ξ 2 π σ i s exp − 10 log 10 s − μ ~ i ρ , θ 2 2 σ i 2 = v i m i m i s m i v i Γ m i ∫ γ th ∞ r m i v i − 1 exp − m i r s v i d r d s.
where Γ z , t = ∫ t ∞ x z − 1 e − x d x is the incomplete gamma function. Pr γ i < γ th = 1 − 1 π Γ m i · ∫ − ∞ + ∞ Γ m i , m i γ th 10 2 σ i x + μ ~ i ρ , θ 10 v i × exp − x 2 d x.